American Museum of Natural History Earth science curator Dentel Ebel addresses a crowd watching NASA’s Messenger probe enter orbit around Mercury. NEW YORK — The audience watching the big screen here at the American Museum of Natural History erupted in applause Thursday night (March 17) when NASA's Messenger probe successfully arrived in orbit around Mercury, becoming the first spacecraft ever to do so. "This is a historic moment," Ebel told the crowd when NASA announced the probe was in orbit. "That’s the announcement we wanted." Messenger launched in August 2004, and has spent the ensuing six-and-a-half years tweaking its path to enable it to enter orbit around the closest planet to the sun without being sucked directly into the sun by the star's overwhelming gravity. "It's fun to see a whole team of people work so specifically to get it right," said amateur astronomer Andrew Montgomery, who came to watch the show. The maneuver last night required precise calculations and perfect execution. Proving just how hard the job of orbital insertion is, a Japanese probe named Akatsuki failed to enter into orbit around Venus as planned in December. But everything appeared to go smoothly with Messenger, according to periodic updates from the scientists at the probe's mission control at the Johns Hopkins Applied Physics Lab. 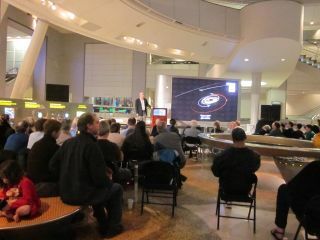 A crowd of about 200 was estimated at the American Museum of Natural History’s event to watch NASA’s Messenger probe enter orbit around Mercury. "I don't understand most of the stuff they're talking about, but I think it's cool that something left Earth and it's out there and it's sending information back to us, which is exciting," said database developer Jeff Cohen after the orbit insertion. His wife, Ewa Cohen, a psychotherapist, admitted she hadn't been familiar with the Messenger mission before attending the event. "Today was the first I'd heard of it," Cohen said. "But I can get excited about anything." The pair had heard about the program from Jason Kendall, a volunteer NASA Jet Propulsion Laboratory (JPL) solar system ambassador for New York City, who said his day job is on Wall Street. "It was a fantastic turnout," Kendall said of the museum's Messenger event. "We had about 200 or so people, I think. I think the museum did a fantastic job hosting it." "There were a lot of people here from the amateur association, but there were a lot of people who had just heard about it," he told SPACE.com. "I saw a lot of people who I knew were coming to something like this for the first time." Lawyer John Delmar said he was a fan of the museum and frequently attended its science events. "I'm interested in science and technology, knowing about the world and the universe, and everything around us," Delmar said. "Everything in space indirectly and directly affects us. Knowing things about Mercury helps us to know things about our own planet. The more we understand about the universe, the more we understand about our very existence."